Fortunately their are choices, like using a slip on shoe like those made famous by classic skate apparel makers Vans. 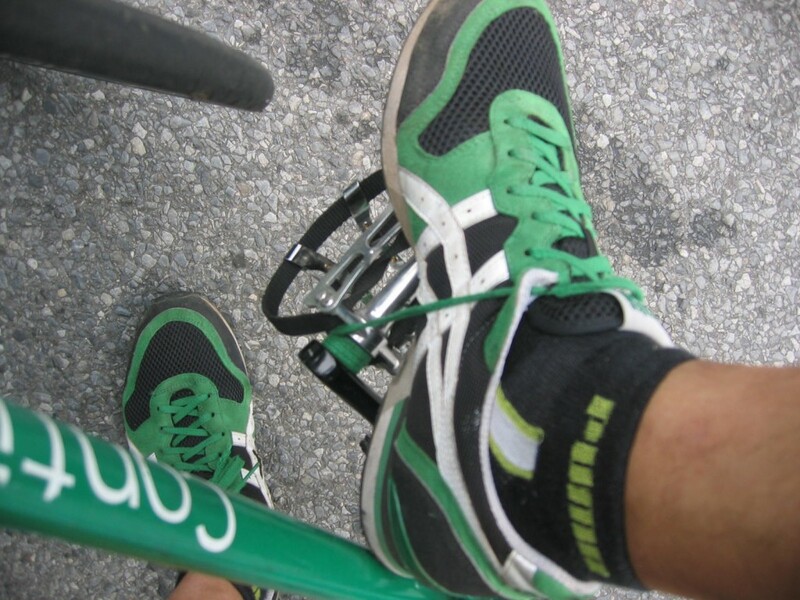 This is a good option and inexpensive vs the specialty cycling shoes, which often have to be used with specific pedals. 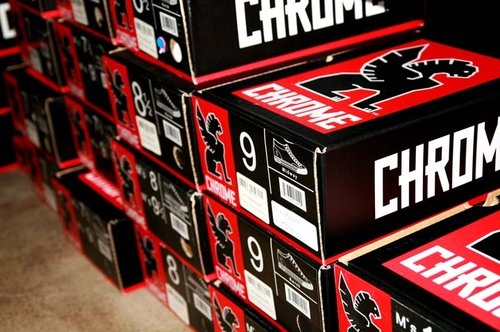 A few years ago Chrome got into the action making shoes. This San Francisco based company, known for making great messenger bags now has a full line of shoes that are comfortable and rugged for the needs of the urban rider and dorks like me who get their shoe laces caught. I really can’t say enough good things about this company. Not only do they make long-lasting functional gear for cyclists, they are deeply involved in the biking community, putting on events and listening to the needs and requests of their riders demands-mainly because they are those same riders. In March of 2010, they had this amazing giveaway called: “Turds for Gold” where they recycled your worn out shoes and gave you new ones of theirs. More on this from Prolly. In addition to their lace up line of low and high top shoes…they now have a new slip on called the Tobruk. What’s with the name? Well if Alex Trebek were asking…”What is the name of an ancient sea-port town on the Mediterranean coast of Libya?” Otherwise I have no idea. 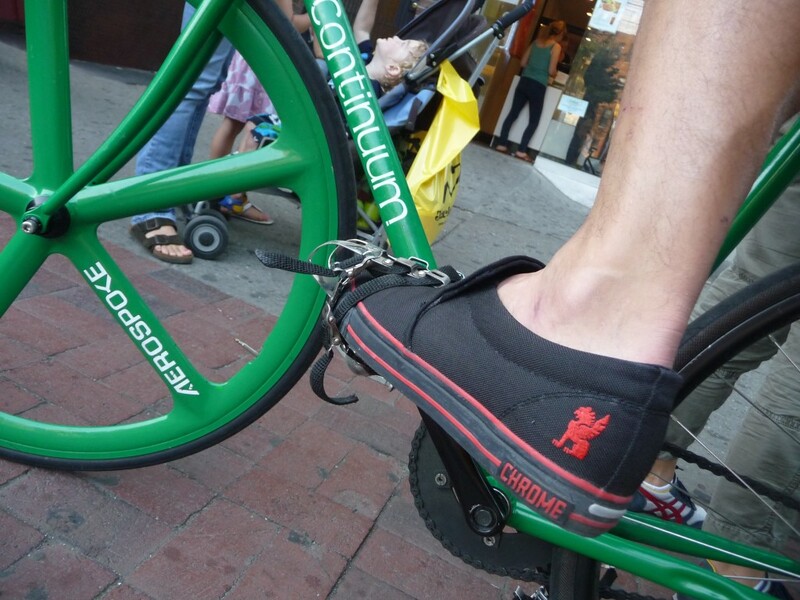 Made from durable Cordura material, these shoes are incredibly comfortable, on and off the bike. They’ve got three ring eyelets on the side for ventilation and a super strong stiff insert which makes for great pedal stiffness. They come in grey and black and sell for around $75.00. I’ve been using them for a couple of weeks now and find them more comfortable than vans. I expected them to be strong and work with the toe-clips of the bike but was really surprised at how comfortable they are to walk around in. I recommend these if you are looking for a light weight throw around slip on. 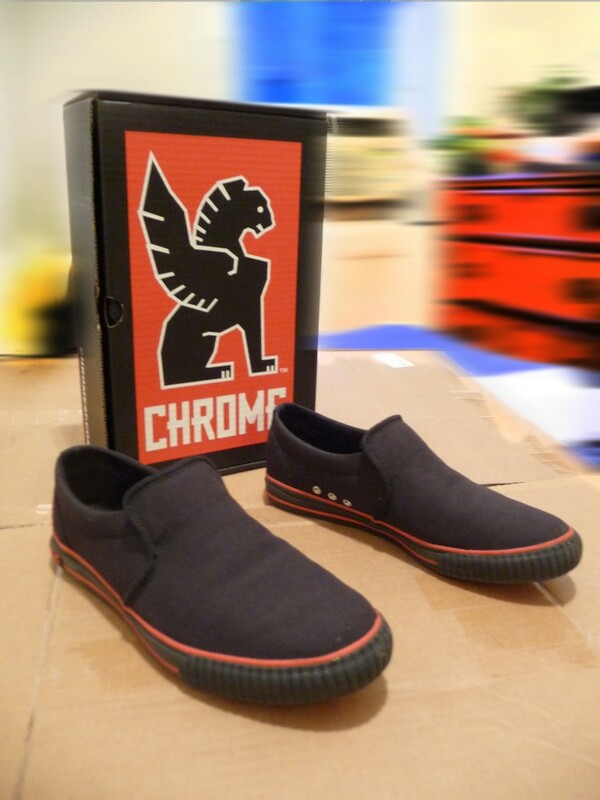 Thanks to Chrome for the hook-up.